Can't beat a good mallet dasher setting the tone. The horns...what an entrance! Classy stuff. 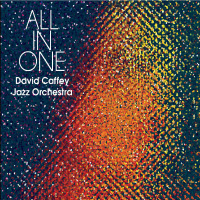 This is a track from the new CD by the David Caffey Jazz Orchestra titled ALL IN ONE, composed and arranged by David Caffey. It features tenor saxophonist Peter Sommer and Greg Gisbert on trumpet. The piece consists of three sections, beginning with a beautiful marimba statement played by two players. Peter Sommer joins the marimba with a heart-felt theme statement that evolves into a driving Latin groove. The last section is in a Brazilian Baiao time-feel that builds throughout with Greg Gisbert's fiery trumpet solo soaring above the full ensemble near the end. David Caffey: composer, arranger, conductor; Greg Gisbert: trumpet; Brad Goode: trumpet; Derek Watson: trumpet; Shawn Williams: trumpet; Wil Swindler: alto, soprano sax, flute; Briana Harris: alto, soprano sax, flute; Peter Sommer: tenor sax, clarinet; Kenyon Brenner: tenor sax, clarinet; Joel Harris: baritone sax, flute; Nat Wickham: trombone; Mike Conrad: trombone; Adam Bartczak: trombone; Gary Mayne: bass trombone; Steve Kovalcheck: guitar; Dana Landry: piano; Erik Applegate: bass; Jim White: drums; Michael Truesdell: percussion (5); Mike van Wirt: marimba (5); Michael Carp: marimba (5).